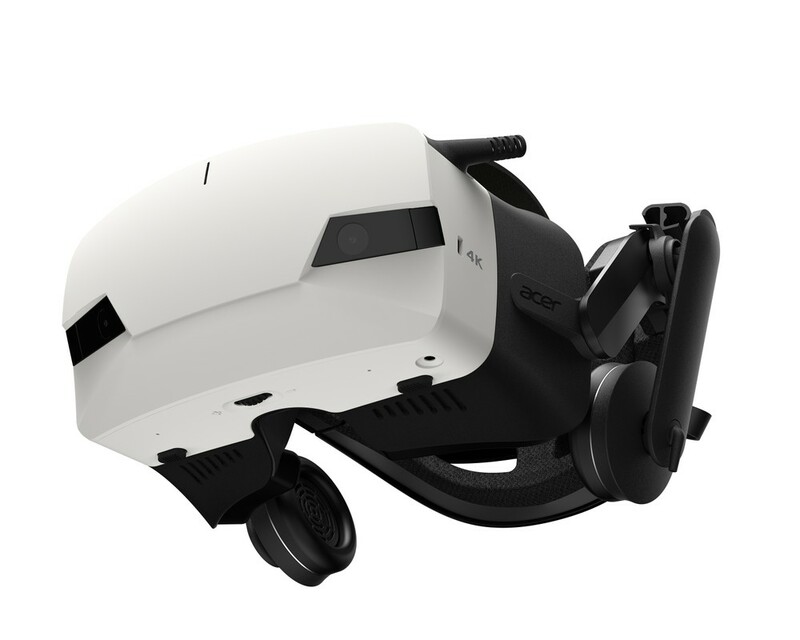 Acer ConceptD is a brand new range of products that are part of the Taiwanese manufacturer’s broad portfolio: it was introduced At its Next@Acer annual hardware event, dedicated to the consumer and corporate public as well as gamers. The target audience is the content creators (graphic designers, engineers, architects, developers and more) and is composed of an initial offer comprising three laptops, two desktop PCs, two monitors, and a Windows Mixed Reality VR headset. Despite the name “Concept”, it is a very concrete proposal, including real products and ready to reach the market. 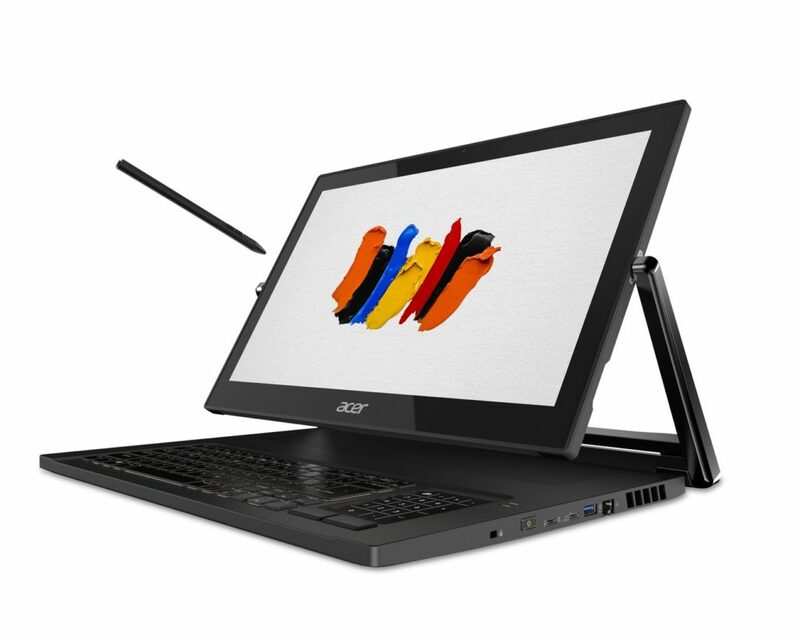 The striking feature is the system based on Ezel Aero Hinge with CNC machining, thanks to which the 17.3″ Ultra HD display (3840 x 2160 pixels) folds up allowing different ways of use: display, ezel, notebooks, and stands. The PANTONE certification ensures that the display offers 100% coverage of the Adobe RGB color space: the color fidelity reaches very high levels with a Delta E lower than 1. For interaction with the display, the Wacom EMR stylus and supports up to 4,096 levels of pressure sensitivity for more accurate sketching, can be magnetically attached to the body. 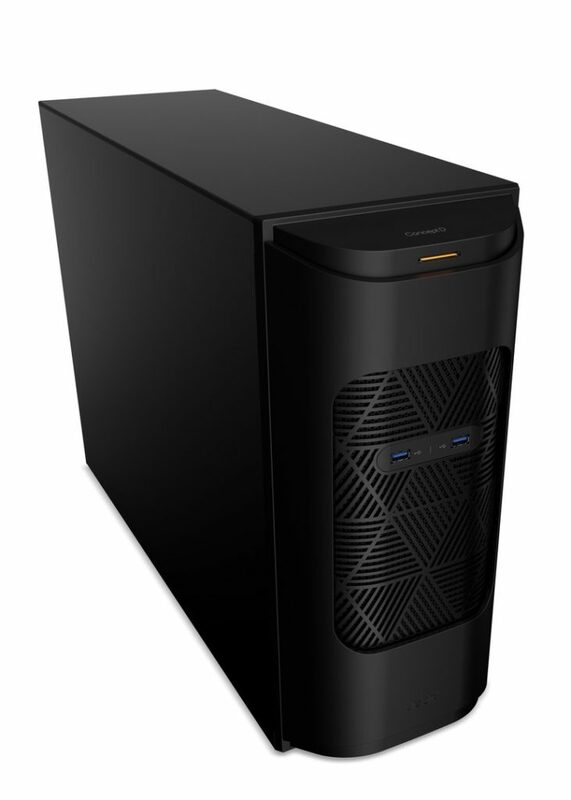 The hardware platform includes Intel Core i9 mobile processors, NVIDIA GeForce RTX 2080 GPU, up to 32GB DDR4 RAM, and up to two 512GB PCIe M.2 SSDs in RAID 0. It is a product that is presented as suitable for those who will use it to create particularly complex 3D creations. The ConceptD 9 laptop is priced starting at $4,999. The design is more traditional than the previous model, but the reasons for interest are not lacking. 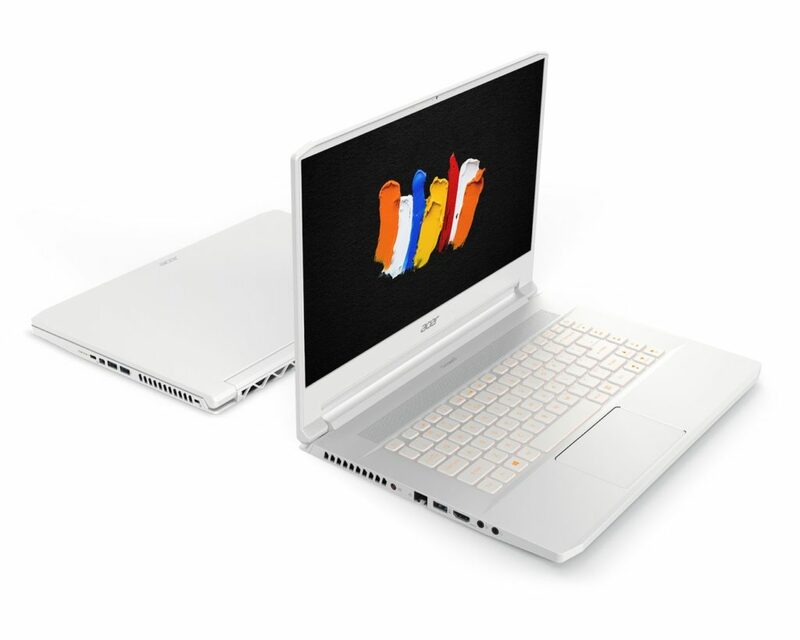 The standard equipment is also very rich in this case: the laptop can be configured with Intel Core ninth generation processors and NVIDIA GeForce RTX 2080 GPU with Max-Q design. 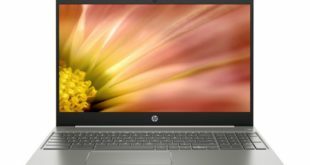 The 15.6-inch screen integrates an IPS Ultra HD panel and it is also PANTONE certified (100% coverage of the Adobe RGB and Delta E color space less than 2). The components are enclosed in a shell that has a thickness of 17.9 mm and a weight of 2.1 kilograms. 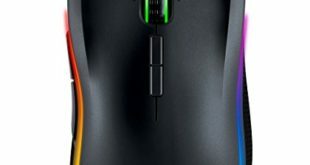 The standard equipment also includes Thunderbolt 3, MiniDP connectors (up to three monitors can be connected) and Killer DoubleShot network connectivity. 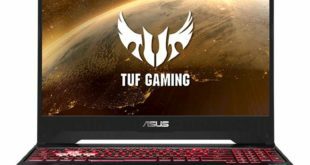 The ideal use scenario indicated by the manufacturer for this laptop coincides with the real-time 6K RED video editing activity and the rendering ones, the company says. This starts at $2,299. Finally, the ConceptD 5 is an even slimmer and lighter professional laptop measuring 16.9mm in thickness and weighs around 1.5kg. It uses magnesium alloy for the lid and palm-rest areas, narrow display bezels and decently powerful internals such as the 8th generation Intel Core i7 processor with Radeon RX Vega M GL graphics, up to 16GB of DDR4 RAM, PCIe NVMe SSD up to 1TBin Raid 0 configuration. It is aimed at those who will use it mainly for 2D graphics projects. The components are enclosed in a metal frame coated with a magnesium and aluminum alloy in the upper part and in the palm rest area and with a magnesium-lithium alloy on the bottom of the base. PANTONE certified screen and surrounded by thin frames (6.2 mm) that allow an 80% screen-body ratio to complete the picture. There is also the presence of Gen 1 USB Type-C, DisplayPort and fingerprint reader. The ConceptD 5 starts at a price of $1,699. The heart of the system consists of two Intel Xeon Gold6148 processors (40 cores, 80 threads), combined with the NVIDIA Quadro RTX 6000 GPU and 12 RAM slots that can accommodate up to a maximum of 192GB of ECC memory. The memory compartment also includes a dual PCIe M.2 slot and offers the possibility of housing up to five storage media in a RAID 0/1 configuration. Also, present three PCIe x8 slots and four PCIe x16 slots. The cooling system is structured in six fans that draw in fresh air from the outside and convey it to the internal components. The exterior of the case is characterized by a matt black metallic coating. It will be available in May in the US for a starting price of $19,999. 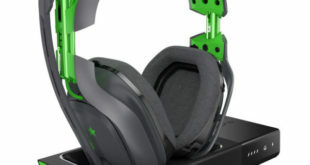 The “younger brother” is configurable with processors up to the ninth generation Intel Core i9-9900K (8 cores, 16 threads, up to 5GHz), while the graphics management is entrusted by the NVIDIA Quadro RTX 4000 GPU. The four DIMM slots on the motherboard allow configurations with up to 64GB of DDR4 memory, while the storage uses the integrated PCIe M.2 NVMe SSD. The cooling system includes three fans that produce a declared noise of less than 40 dB. 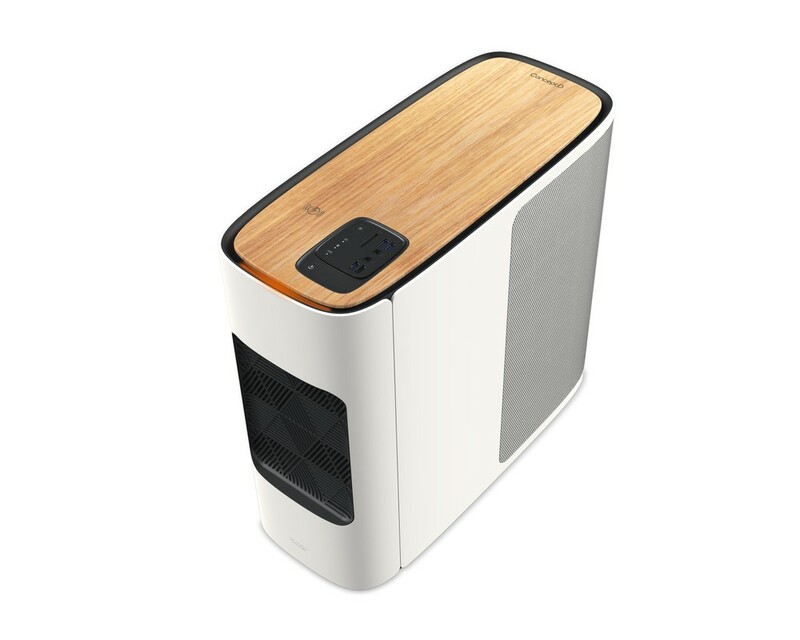 Everything is housed in a white tower case with the upper part made using a finish that recalls the grain of the wood – it is possible to use this surface to recharge the devices compatible with the wireless Qi standard. Prices start at $1,699 and will be available starting June in the US. The ConceptD CM7321K is a 32-inch monitor suited for 2D creators. This 32-inch, 4K UHD panel is DisplayHDR 1000 certified and has 1152 zones of local-dimming LEDs. It also has things like 99 percent coverage of the Adobe RGB color space, 89.5 percent Rec.2020 for mastering content. Its priced at $3,199 and will be available from September in the US. 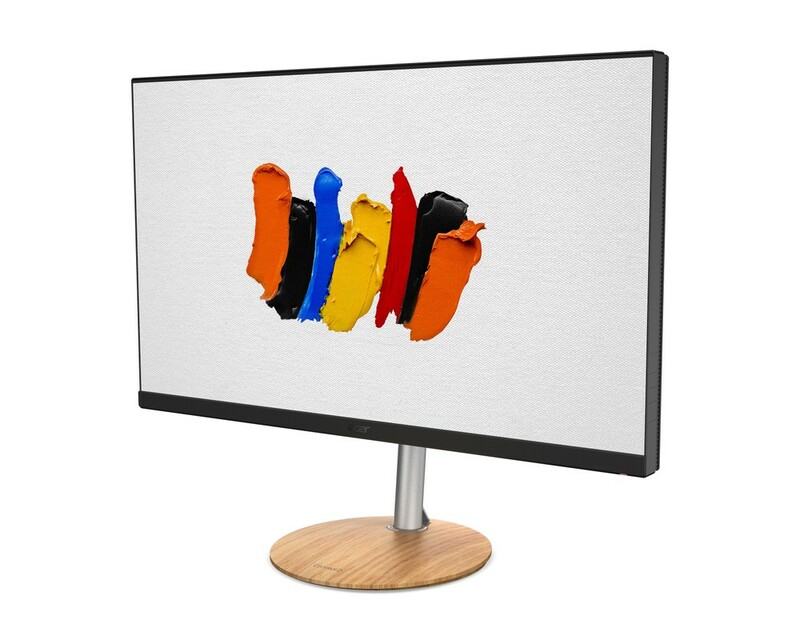 The ConceptD CP7271K is a Pantone-validated 27-inch monitor optimized for 3D creators. It features a color accuracy of Delta-E <1, a wide color gamut of 99 percent of the AdobeRGB color space, and 93 percent DCI-P3 color space. It also features G-SYNC Ultimate and DisplayHDR 1000 for professional-grade color and image detail. It’s priced at $1,999 and will be available in the US starting July. The OJO Windows Mixed Reality VR headset equipped with a 4320 x 2160 pixel display closes the picture. It comes with a white finish, detachable and swappable head strap design, inter-pupil distance adjustment, and controls for interpupillary adjustment via software. It offers 6 degrees of freedom and integrates an audio system. 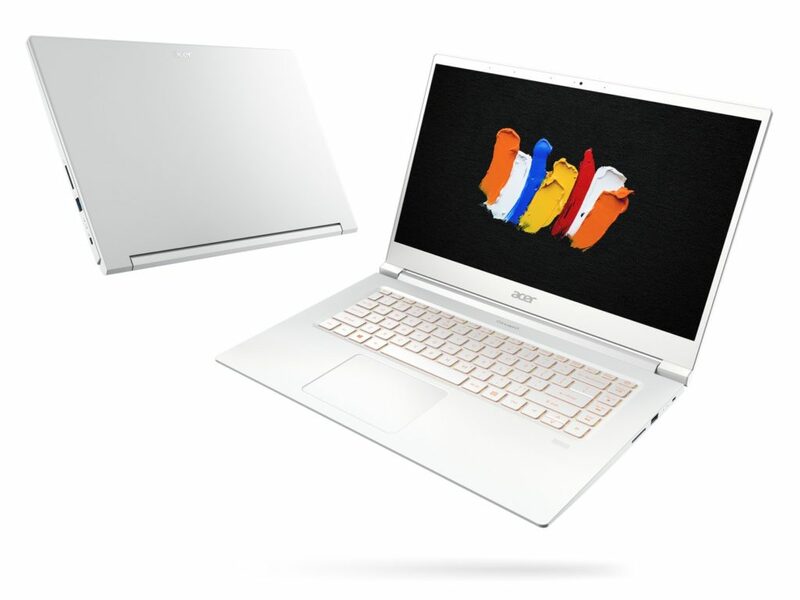 Acer hasn’t revealed the pricing of this yet.